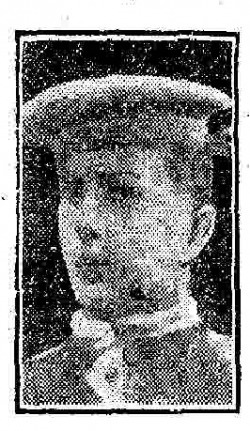 Leonard Gordon Winn was the son of Gordon Archibald Winn and Edith C Wright. He was the brother of Violet and John. Leonard's father was employed with the H.M. Dockyard and the family lived at 388 Canterbury Street. During the weekend before Leonard's death he had taken part in the Kent Scout marathon. When he was eleven he won a free place scholarship to the County School. He was popular with all that knew him. Leonard was a gallant and heroic little man of thirteen. His calm and courage was inspirational. In angony and blinded by his burns he asked his father to sit with him. "Daddy, how are the other boys" he asked "Did they get away?". Of the fire he said "Suddenly the whole building seemed to turn into a blaze. There was no time to do anything. The heat was just terrible. But I rushed to the end of the roof and jumped". Shortly after speaking this heroic child would pass away. His thoughts up until the time of his death were only for the others. 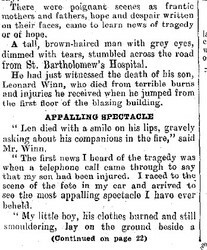 Leonard was admitted to St Bartholomew's Hospital at 10:35 on the night of the fire. He was suffering from extensive burns to his face, neck, arms, hands, chest, abdomen and back. Mr. Winn had said the day after the fire "My boy was only asked last night to play his part. It was late and I asked Len not to go. The boy was so enthusiastic, however, that his mother asked me to grant him permission, and I did. I was not at the park myself, and the first news I had was when a telephone call came in to say that my son had been injured. I raced to the scene of the fete in my car. 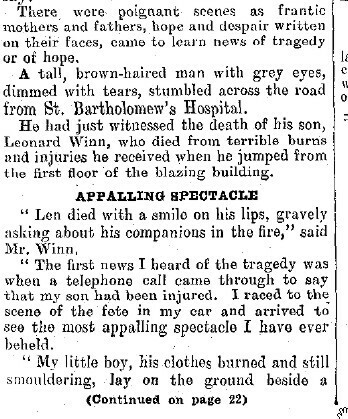 My little boy, his clothes burnt and still smouldering, lay on the ground. 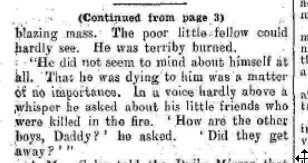 The poor little fellow could hardly see. He was terribly burned. I lifted him gently and placed him in my car, then raced along the road to the hospital. All through the night I sat by his bedside. He was so brave - oh so brave." 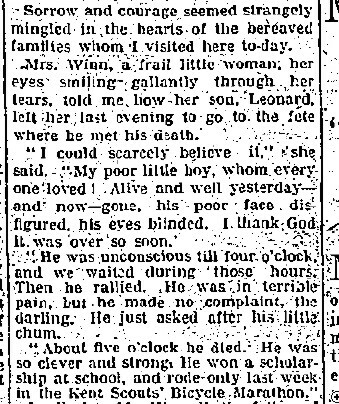 Leonard died at 4:45 am the following morning from shock due to his extensive burns. Leonard's coffin was carried to the cemetery on a fire engine. 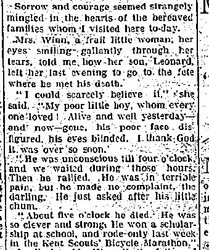 Leonard's parents Edith C Wright and Gordon Archibald Winn would be buried with their son Leonard when they eventually passed away.